By the end of February, 1954, Daigo Fukuryu Maru was fishing near Bikini Atoll. Yes, THAT Bikini Atoll. Supplies were running low, and they planned to fish one more day before heading back to port. None of the crew had any idea that the US Government had established an exclusion zone around Bikini Atoll because they were planning a Hydrogen bomb test. The hapless vessel was outside the exclusion zone, but that was little consolation after the fact. Daigo Fukuryu Maru rode out the waves and the fishermen went to work just as always. Even when a cloud of mysterious white particles began to rain softly down, the men pulled in their lines and stored their catch, then weighed anchor and set off for Yaizu. As Oishi told it, “White particles were falling on us, just like sleet. 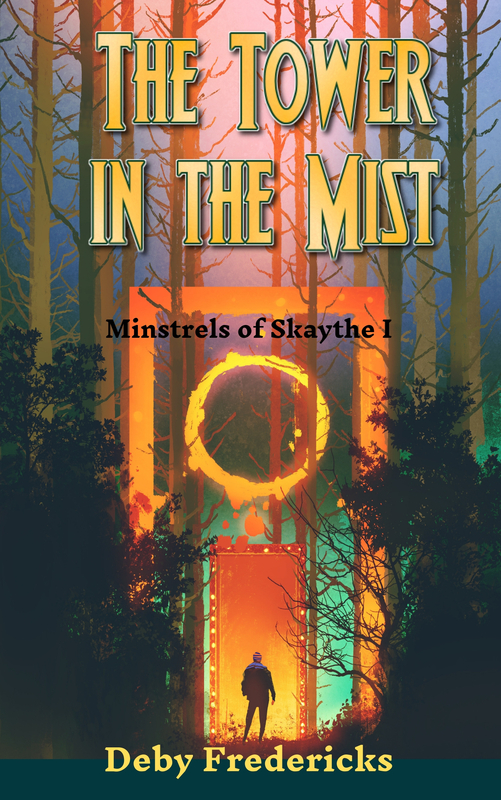 The white particles penetrated mercilessly – eyes, nose, ears, mouth. We had no sense that it was dangerous.” Some of the men even tasted the stuff, trying to figure out what it was. Later testing determined this “death ash” was actually powdered coral blasted off the atoll by the explosion. By that evening, all the 23 crewmen felt nauseated — the first symptom of radiation sickness. When they reached Yaizu, on March 14th, all the men were deathly ill, covered in burns and bleeding from their gums. The crew was quarantined, all their possessions buried. Unfortunately, the cargo of tuna had already been unloaded. When the diagnosis of radiation sickness became known, the government mounted a desperate search to locate and destroy the toxic seafood. At least some of it was likely consumed by unwitting customers. Even this was only the beginning. Fallout from the Castle Bravo detonation rendered much of the fish in the Pacific toxic. Everything brought in to any Japanese port had to be tested for radioactivity. Even some crops in the fields were poisoned by fallout. The same must have been true in many neighboring countries, and so the full economic consequences took years to unfold. For the crewmen personally, their lives were changed forever. Since the nuclear explosions at the end of World War II, nine years before, radiation sickness occupied a special place of horror in the Japanese mind. Anyone so afflicted was shunned, because radiation sickness was thought to be contagious. Although only one crewman died in the short term, most of the survivors had to move to new towns and start over, hiding the shameful secret of their former illness. And they were not alone. In all, around 100 fishing boats of various nations were in the vicinity of Bikini Atoll on March 1, 1954. Many crew were exposed to contaminated material. Fallout was heavy on the Marshallese Islands of Utirik and Rongelap. Residents weren’t evacuated for 2 days, also suffering from radiation sickness. Infants born in the aftermath suffered birth defects. Much of the scientific knowledge about radiation sickness itself comes from studies carried out after Castle Bravo. Yet, even today, some parts of the Marshall Islands remain unsafe for habitation. Adding insult to injury, the US Government was not forthcoming about what had occurred. Secrecy in nuclear testing was paramount, as was staying ahead of the USSR. Confronted by Japan’s government, US military sources claimed that Daigo Fukuryu Maru had been at Biniki Atoll on a spying mission. Only years later, and begrudgingly, did the US pay a miserly reparation to surviving crew members of the Daigo Fukuryu Maru. The detonation of Castle Bravo, and its unanticipated levels of fallout, led to world-wide protest and re-evaluation of nuclear testing methods. This continued to build into the No Nukes Movement of the Seventies and Eighties. Matakichi Oishi, who tasted the “death ash,” frequently spoke at demonstrations. As for the ship itself, Daigo Fukuryu Maru was renamed and kept fishing for several years. In 1976, the trawler was permanently preserved in the Daigo Fukuryu Maru Memorial Hall at Toyko’s Metropolitan Museum. And there was one other consequence. A very, very big consequence. An “Oh no, there goes Tokyo!” consequence. I’ll tell you about that on Saturday. While I’m on the topic of lizards, I might as well talk about Water Dragons, too. Bearded Dragons (my last post) and Water Dragons have similar names, and both are part of the Agamid lizard clan. Like Bearded Dragons, the Water Dragons we see in zoos and pet shops are a cluster of related species and sub-species in the Physignathus branch of the family. They hail from Myanmar, Thailand, Vietnam, Laos, Cambodia, Southern China and parts of Indonesia. They are not to be confused with Water Monitors, which share some of the same habitat. Water Dragons are somewhat larger than Bearded, with males measuring up to 3 feet in length. In the natural environment, these are jungle lizards. They have smooth green hide with lighter streaks on the sides, and a ridge of short spines down the back to the tail tip. Excellent swimmers, they will escape into water when threatened. They are good climbers who hunt for insects or small mammals in treetops. They also eat small fish. Water Dragons have an intense need for space, beyond what you might expect an animal that size to need. If the cage is not large enough, they can seriously injure themselves trying to escape. They are surprisingly sensitive creatures, prone to many parasites and ailments in captivity. Beautiful as they are, these animals are not recommended for inexperienced reptile owners. Water Dragons are among the group of animals who are flexible enough to adapt and coexist with humans. They remain widespread in their original range and are not currently considered threatened or endangered. Swim on, Water Dragons, swim on. Just to follow up on my last post, here are some facts about Bearded Dragon lizards. These are members of the scientific family Pogona. All eight species are native to the deserts and dry forests of Australia. Like many lizards, they are quadrupedal with low bodies and broad, triangular heads. Males can grow to two feet in length and females are slightly smaller. The scales are shades of buff, tan and gray, with short spikes along the back, behind the head and under the throat. The spikes can be raised to deter rivals or predators. Bearded Dragons communicate among themselves in interesting ways. The “beard” under the throat can puff up and turn black, a display to intimidate other Bearded Dragons or to woo females. This behavior is what gives them their name. They also bob their heads to express dominance and slowly wave one paw to show submission. In their natural habitat, Bearded Dragons are equally comfortable on the ground or climbing rocks and trees. Young feed mostly in insects and switch over to vegetation as they grow older. Due to the arid surroundings, Bearded Dragons are most active at dusk and dawn. They are cold-blooded and must bask or seek shade in order to control their body temperature. Under Australian law, traffic in wildlife for pets has been forbidden since the 1960s. Nevertheless, Bearded Dragons have become popular pets. They are smaller than other lizards, such as iguanas, and tolerate a lot of handling, especially from children. Indeed, I once knew a teacher who occasionally brought her Bearded Dragon with her to school, much to the delight of the students. Fortunately, there are enough captive bred lizards to satisfy the demand for pets. Bearded Dragons continue to thrive in the wilds of Australia and no varieties are endangered as of this writing. Here’s a true story from the news of my region. Sherrie Baldwin, of Salem, OR, is a reptile devotee who made the news after she gave her pet Bearded Dragon mouth-to-mouth resuscitation. She had found the lizard floating in water in its cage. The incident gained national attention, and Baldwin enjoyed her 15 minutes of fame. Unfortunately, her landlord was disturbed to learn that Baldwin had been rescuing Bearded Dragons from the area and keeping them in her trailer. She had as many as 24 Bearded Dragons on site. However, the rental contract did not allow reptiles as pets. As reported by the Salem Statesman Journal, Baldwin had to find new homes or face eviction. When news of her dilemma spread, the public responded with a remarkable outpouring of support. Hopeful Bearded Dragon owners contacted Baldwin from as far away as New York and Dallas. As of Friday, October 17th, all but a few lizards had been surrendered to new owners at no charge, simply on the promise that they would be well cared for and some under veterinary care would continue to receive medication. The next step is for a local church group to help Baldwin with cleanup required by her landlord. Let’s hope they honor her efforts and allow her to remain in her home. This dragon is a little harder to see, but it’s my favorite of the recent batch. It’s a bamboo chime with a toy dragon perched on top. 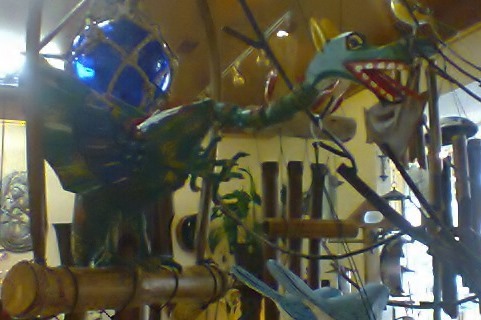 The dragon is carved of wood and articulated so its head bobs and wings flap as the wind touches it. We spotted it in a gift shop in Sandpoint, ID. My photo doesn’t capture its full cuteness! Here are two more dragons I encountered in the real world. On beer labels, no less! 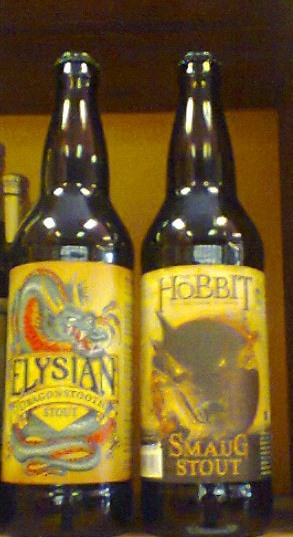 These were on a shelf at Pour Authority in Sandpoint, ID. Just yesterday, a spotted another dragon on the six-pack carton of Dragon’s Breath beer from Bayern Brewery in Missoula, MT. I’m not a beer drinker, but I snagged that for my husband. Is there a thing about dragons and beer that I didn’t know about? I’ve been spotting lots of dragons lately! 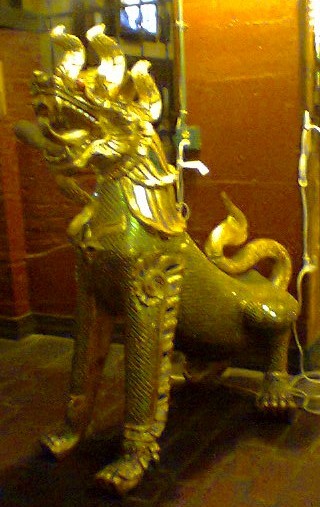 This is one of a pair that guards the entrance to the Spokane Bangkok Thai Restaurant, in the Riverwalk area. It is about 4 feet tall, with a metallic look, but I suspect it’s actually resin.